Laguna Beach : The best place on the Southern California Riviera! Thinking of taking a vacation? Look no further than Laguna Beach, California! Miles of gorgeous southern California coastline with an endless horizon, Laguna has it all. Beaches, art and the southern California life style make Laguna Beach a perfect place for anyone who is planning a vacation. This painting, created by Vincent Farrell in 1982, was taken from the vantage point of Hiesler Park in Laguna looking south, toward Main Beach Laguna. For more information about beaches and places that locals from Laguna love, check out the Laguna Beach Visitor’s Bureau . The city of Laguna Beach lists a vast amount of information, as well as, recreational activities, places to park and other helpful information. For tickets to the acclaimed Laguna Beach Festival of the Arts and tickets to all other festivals check out, the Laguna Beach Passport which is the art festival passport and allows multiple entry into all three of Laguna Beach’s art festivals. 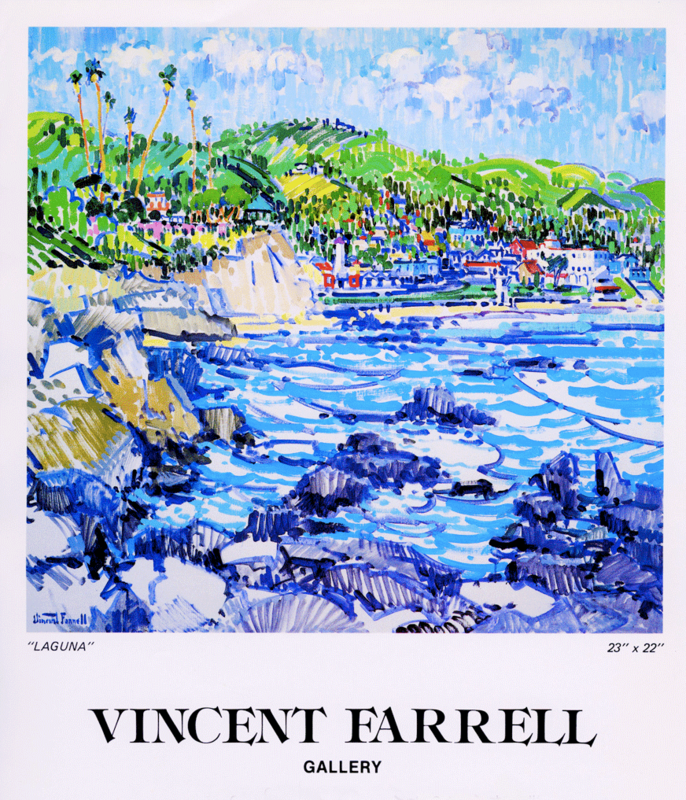 This entry was posted in "Fruit and Flowers", Art, Art as a Lifestyle, Art for the Home, Art Market, California, California Artist Vincent Farrell, Design, Love, Music, News, politics, Shopping, Vincent Farrell, Vincent Farrell Artist and tagged "Laguna Summer" by Vincent Farrell, "Laguna" by Vincent Farrell, California, California Artist Vincent Farrell, Laguna Beach, Laguna Beach California, Laguna Beach Visitor's Bureau, Recreation, Southern California, the Laguna Beach Festival of Arts by vincentfarrellartist. Bookmark the permalink. Vincent Farrell's painting of "Monet's Garden"